'The Banach-Tarski Paradox' co-author Grzegorz Tomkowicz describes the differences between the first and second edition of the classic book and touches on the relationship between mathematics and natural sciences. The Banach-Tarski paradox is a very striking theorem; it asserts that the unit ball in R3 can be cut into pieces and rearranged by isometries to obtain two unit balls. This result shows that it seems to be a gap between our understanding of mathematics and physical reality. So it is natural to ask what is the exact relation between mathematics and natural sciences. There were several attempts made by physicists, including Augenstein, Pitowski and Svozil, but there are no satisfactory conclusions. Strictly speaking there is no satisfactory physical theory involving Banach-Tarski paradox. It is worthwhile to mention that a coherent programme describing the distinction between physical reality and mathematics was proposed recently by Jan Mycielski. In spite of the above mentioned difficulties, there is a huge interplay between the Banach-Tarski paradox and pure mathematics. The first edition of The Banach-Tarski Paradox had a great impact on some difficult problems, including Tarski’s circle-squaring problem and Marczewski’s problem. And it appeared at a time of intensive research in the areas related to the Banach-Tarski theory. We could mention here the solution of Ruziewicz’s problem. 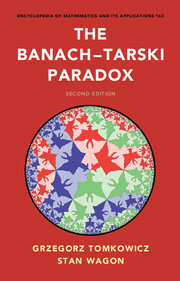 The second edition of the “The Banach-Tarski paradox” has similar features. There are several active research areas providing spectacular solutions of some open problems. First of all we mention descriptive combinatorics which provides tools for a solution of the circle-squaring problem with Lebesgue measurable pieces or a radical simplification of the construction of paradoxical decomposition of the unit ball in R3 with the pieces having Property of Baire. This thread leads also to some applications of paradoxical decomposition to the theory of games with incomplete information (which are quite close to physical reality). There is still also an intensive feedback between amenability and paradoxical decomposition. However only recently it appeared that transversality theory and theory of o-minimal structures have some significant meaning for paradoxical decompositions. We hope as in the case of the first edition, the second edition provides a lot of new research.